One type of oolong that I have very little experience with are the Dan Cong oolongs, aka Phoenix oolongs from China's Guangdong province. I have been saying for a while that I would like to try more Dan Cong, and my good tea friends sent me this 2014 Wu Dong Shan dan cong, which is sold by Yunnan Sourcing. The more I shop around for Dan Cong oolongs, the more I notice that they can have a range of oxidization and roast levels. Although I don't have much to compare it to, this one has some fairly dark leaves, but still a bit of green showing, so I'm assuming that it falls in the middle of the spectrum. It looks similar to Wuyi yancha, but the aroma is a bit more floral and has some grape notes. The weather was perfect today so I decided to have this session outside. I had about 7g of this tea in my gift box and decided to put all of it in my 120ml gaiwan. I'm also using my new Noir Dragon cup I bought last month after falling in love with this new textured glaze technique they have been using. 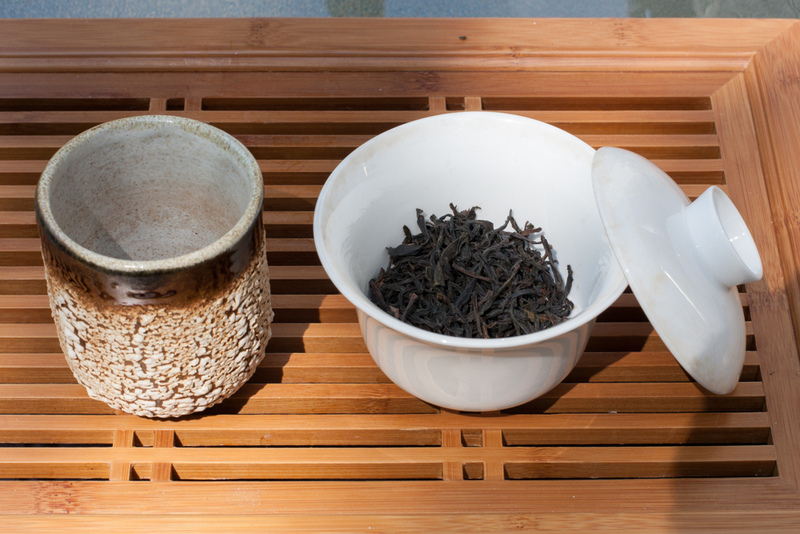 I have heard that Dan Cong oolong can be a tricky tea to brew correctly. Apparently it can take on a very bitter taste if not brewed carefully. I have experienced this with one other Dan Cong before and the bitterness was almost a very offensive metallic taste that lingers in the mouth long enough to ruin the entire session. I can see why someone might get frustrated with Dan Cong oolong if they are consistently getting that flavor out of it. After doing a little bit of research and asking around, I found a few different techniques and tips. I ended up going with water near boiling, which seems a bit counter-intuitive when trying to avoid bitterness, but I kept the duration of the first several infusions to flash-brew speed--water in and tea out without any stopping or waiting. I also discarded the first two infusions (i.e. I did two rinses) as suggested by a friend on Reddit. Someone also suggested pouring the water into the gaiwan off to the side of the gaiwan and letting it rise up around the leaves rather than pouring directly on top of the leaves. I'm not sure if that makes a difference or not, but I decided to follow that tip as well. 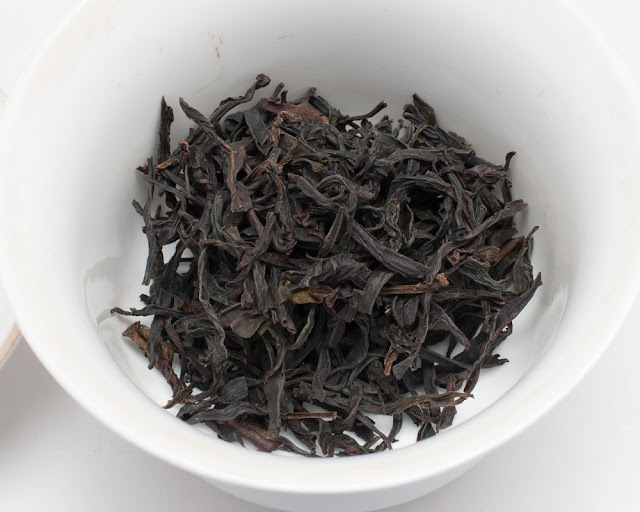 Yunnan Sourcing 2014 Wu Dong Shan Dan Cong Oolong in Noir Dragon cup. The brewing technique research paid off-- the tea came out perfect! It has a crystal clear golden orange liquor with nice thickness and fruity/floral aroma. 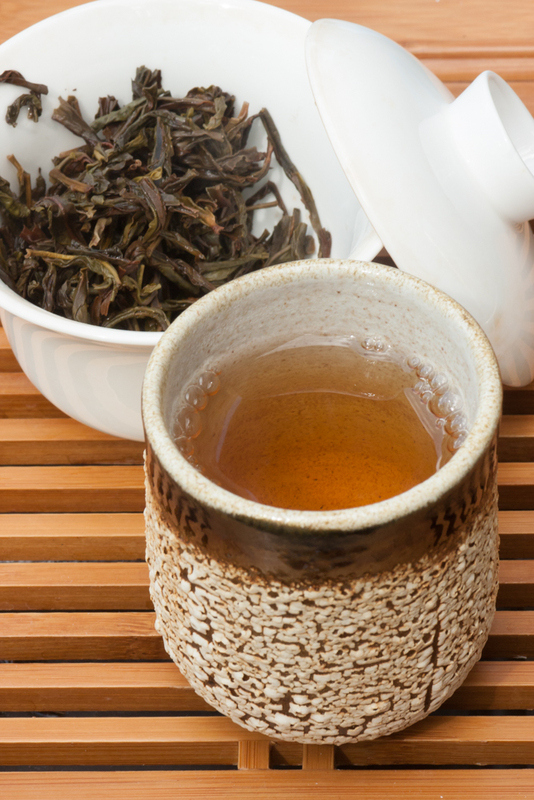 The wet leaf actually smells a lot like a young sheng puerh, but a bit sweeter. The wet leaf also shows that this tea is actually much lighter oxidized than you might expect from the dry leaf, but the golden orange liquor shows that it's definitely not a "green" style oolong which might produce a more yellow liquor. I have heard that some of the higher oxidized/roasted Dan Congs can produce a color that is almost purple, though I have not experienced that yet. Although Yunnan Sourcing sells this Dan Cong under the name "Wu Dong Shan Dan Cong," it may also be considered a "Mi Lan Xiang" Dan Cong, which means "Honey and Orchid Fragrance." That description is very accurate for the flavor of this tea. The overall flavor profile is very floral and it has a honey sweetness. Interestingly though, I also find that it has a slight sweet smokiness similar to some young sheng, and it also has a very refreshing fruity flavor. Drinking this tea outside on a beautiful spring day was an excellent idea. I hesitated to mention this, but something about the natural sweetness of this tea and the fruity/floral characteristics combine to create a really interesting flavor that reminds me a lot of grape flavored Kool-Aid. That may be a stretch of the imagination for some, but grape Kool-Aid instantly entered my mind when I tasted this tea. That confirms even further that drinking this tea outside on a nice spring day is a great way to enjoy this tea, and I am very glad I had this experience. I would like to continue to get to know this type of oolong, and I would not be surprised if Dan Cong oolongs end up being one of my favorite types of oolong at some point in the future, but they might have a hard time surpassing the warm dark fruit characteristics that I love in a good Wuyi yancha. Perhaps I will drink Yancha in the fall and winter, and Dan Cong in the spring and summer. Thank you for sharing your experience and how to get this tea in detail. I am sure most of us a greatful for that. Great article!